As BIOS Marine Superintendent, Quentin is responsible for the overall operation of the R/V Atlantic Explorer. This includes overseeing vessel maintenance, ship scheduling, long-term planning, personnel management, and compliance with all pertinent rules, regulations, and laws. Quentin manages the four National Science Foundation grants which provide financial support for the vessel, and prepares proposals and submits interim, annual, and final reports. He also sails as Master of the R/V Atlantic Explorer approximately 45 days each year. Quentin graduated from the United States Merchant Marine Academy in 1983, with a U.S. Coast Guard Unlimited Third Mate’s license and a B.S. in Marine Transportation. He returned to school and upgraded to a 1600 ton Master’s license in 2004. 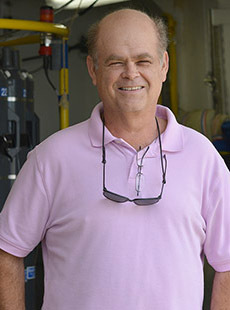 Quentin has had a multi-faceted career since graduating from Kings Point, working on an air cushion vehicle (hovercraft) in Alaska, a SWATH (small water-plane area twin hull) vessel in California and Georgia, and then returning to his home to work at Duke University Marine Laboratory in Beaufort, NC in 1988. After 2 years as captain of a 50 foot coastal research vessel, he was promoted to Marine Superintendent of the Duke/University of North Carolina Oceanographic Consortium in 1990. In this capacity, he managed the operation of the R/V Cape Hatteras, an oceanographic research vessel in the UNOLS fleet. In 1996, he was promoted to Manager of Marine Operations, managing the operations of both the R/V Cape Hatteras and a group of small coastal research craft for Duke University students, faculty, and oceanographic researchers. After 13 years managing the Duke research vessel operations, Quentin left to start his own company, Vessel Deliveries and Marine Services, Inc., a marine consulting and vessel delivery business. It was during this time that he was initially contracted by BIOS to serve as Master of the R/V Atlantic Explorer, a position he held from April, 2007.